These little bites can be made in minutes with just a handful of real ingredients. 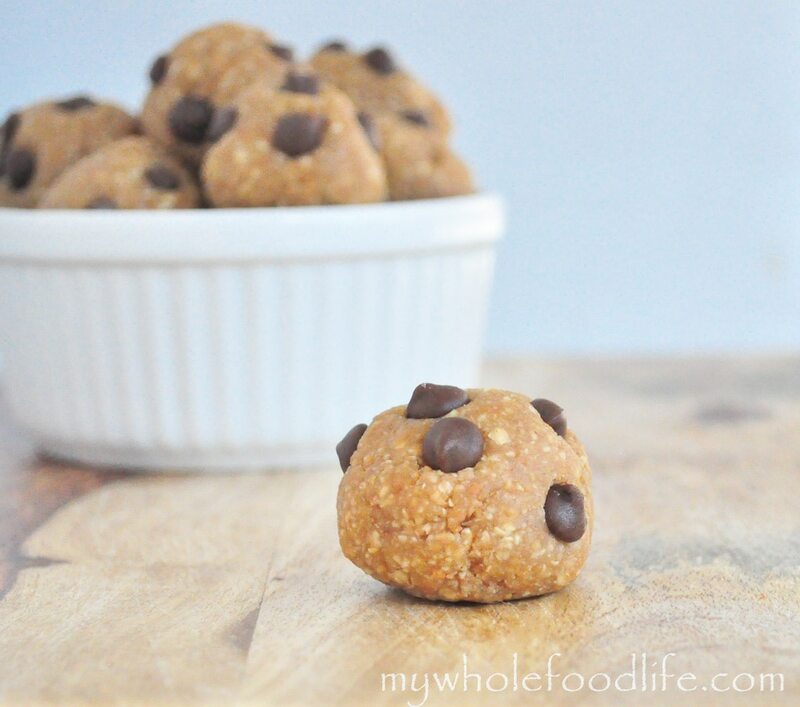 Peanut butter and chocolate were just made for each other and these cookie dough bites are delicious! This is a great recipe to make with your kids too. My daughter had a lot of fun rolling these into balls and sticking the chips on. She was also trying to sneak in bites for herself as well. 🙂 I am a big fan of everything no bake. Who isn’t? 🙂 These are the peanut butter version of my No Bake Cooke Dough Bites. In the food processor , blend up the peanuts and oats. Once they are ground into a course consistency, add in the rest of the ingredients except for the chocolate chips. You may need to soften the peanut butter slightly to get it to blend well. Pulse until a dough starts to form. Roll into balls and stick on the chocolate chips. Place them in the fridge to set for about 30 minutes. I got 12 balls out of my batch. Enjoy! Wow, what a fun giveaway!! Thanks for the chance to win. I liked your FB page and Cuisinart's FB page as well!! 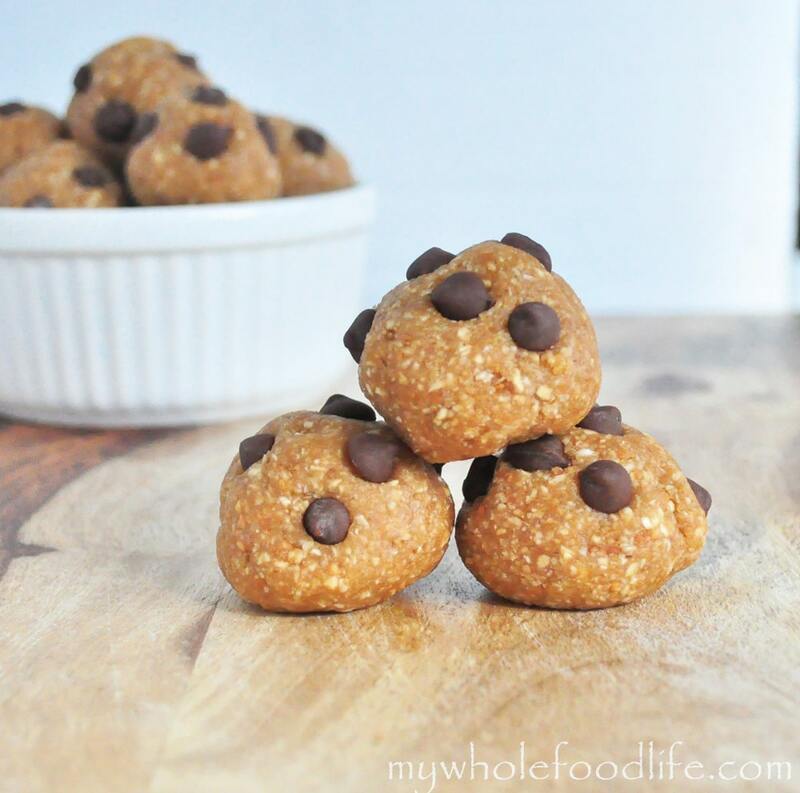 These cookie dough bites look delicious! They'll definitely be the first thing I make if I win the food processor! Going to try these, thanks! I think I'll be spending a lot of time on your website! We're trying so hard to get away from the processed junk :) Thanks for the chance to win the Cuisinart as well! Hope I am not too late! I just found you on Pinterest and am going to make the pb cookies today! I've been absolutely DYING to make recipes like this -- where ingredients must be very thoroughly ground -- but I've never had a food processor and my blender is a cheap piece of junk. I would be happy out of my mind if I won this contest (: thanks for putting it on! Would love to win this, so I can try all these yummy recipes! I would love to win a cuisinart. My food processor is is about ready to give out on me. Count me in on this one. I really enjoy your site, and have been recommending to my clients as well. I used Enjoy Life chips. They are soy free and gluten free. You can use any chips you like. wow - there were so many responses on this I did not take the time to read them all - my question is this - did you use raw peanuts or roasted for these??? I used raw unsalted peanuts. You can use roasted as well. I love the recipe! Just make sure you watch out for the peanut butter; it can be filled with not-good for you stuff. just check the label before using it!